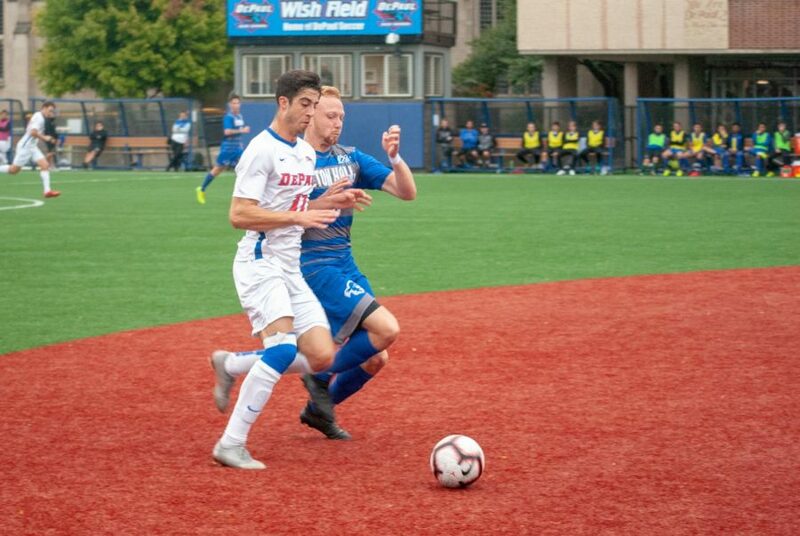 The Blue Demons men’s soccer team find themselves in seventh place, holding an identical 1-2-1 record as their rival Seton Hall after tying the Pirates 1-1 in a physical match on a rainy Saturday afternoon at Wish Field. 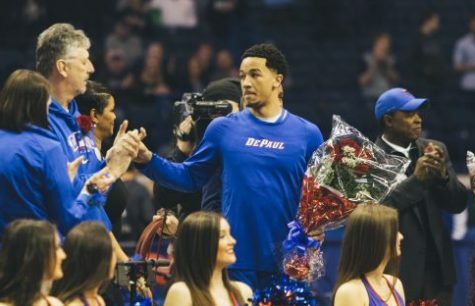 DePaul leads the all-time series with the Pirates, 5-2-1. 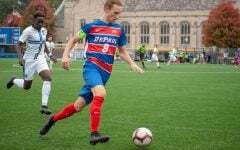 In the 55th minute, DePaul’s final third started clicking when midfielder/forward Timmy Iscra tested goalkeeper Andreas Nota with the first most threatening opportunity to get the tying goal. 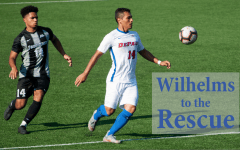 DePaul was reward when Zach El-Shafei scored the equalizing goal in the 58th minute. 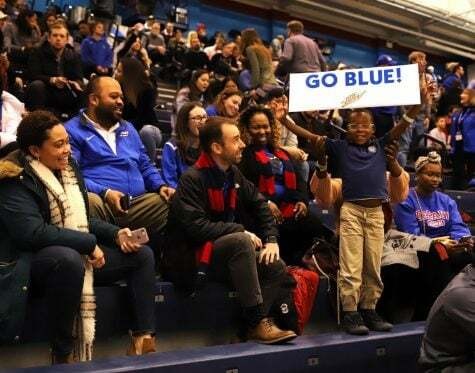 Players were bunched into the box scrambling for position, and fortunately for the Blue Demons the ball landed on Shafei’s leg for the tap in off a cross by Jake Fuderer. Seton Hall frustrated the Blue Demons’ backline, as they were constantly occupying space within areas behind their opposing defenders. 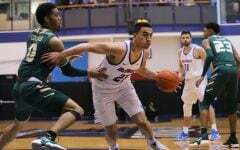 DePaul committed six fouls in the first half, compared to the Pirates two. 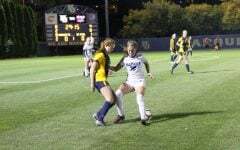 The Blue Demons defensive shape became compacted, as the Pirates kept getting behind runs in the proximity of goal. Seton Hall fired seven shots in the first half. 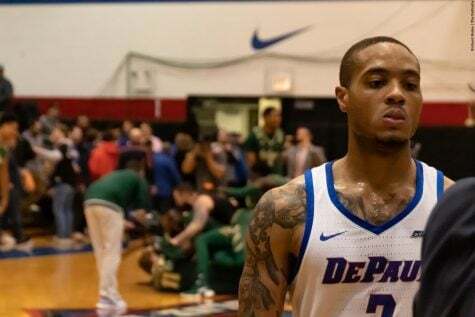 It kept DePaul’s midfielders at bay, playing deep to support the defense. As a result of this long balls were played up top to El-Shafei, but the lone striker had no support with the attacking midfielders playing deeper, hence the Pirates dealt with DePaul’s striker. In the 42nd minute the Pirates opened the scoring when Carlton McKenzie launched a ball into the left flank, as Francisco Alderete went through two DePaul defenders, and scored his first goal of the season. El-Shafei’s speed caused open pockets of space behind Seton Hall’s defensive line. Plotkin said he was extremely proud of his side giving an overall effort with enthusiasm and work rate in the second half. 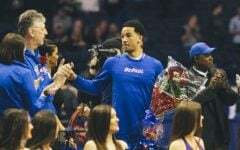 The head coach added that during halftime there weren’t any tactical changes, rather it was a mental adjustment that needed to be made. 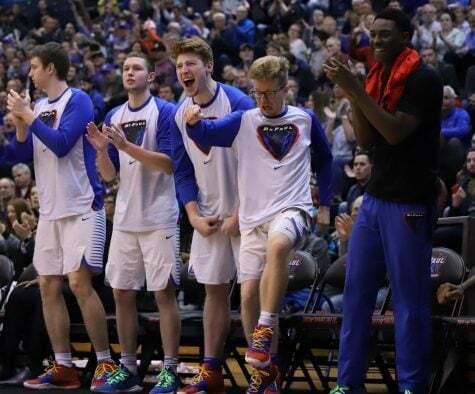 Despite their fullbacks being pinned down in their own half, the Blue Demons dominated possession in the last 45 minutes of regulation and created 10 shots within the half. 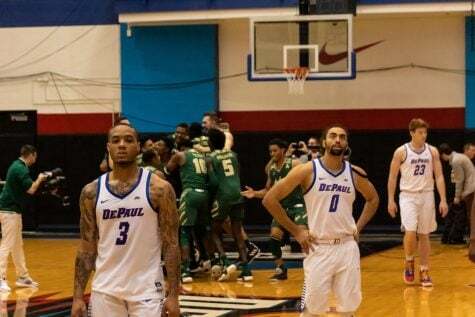 DePaul shot seven shots on goal while Seton Hall accumulated nine shots on goal, both teams totaled 16 shots. 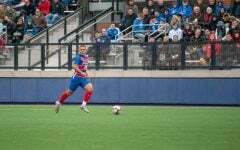 The Blue Demons extended their possessions with four corner kicks in the second half and five corner kicks in the first 10 minutes of overtime. The sole striker played a bit deeper role through the course of the second half. 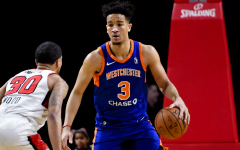 He said the focus was to get closer to the ball and to press Seton Hall’s defenders, making them uncomfortable as they attempted to build the attack from the back. With a minute left in regulation, Seton Hall midfielder Alex Pozesky fired a shot from the near post but goalkeeper Drew Nuelle made a diving save to help the Blue Demons end a three-game losing streak, albeit with a tie. Nuelle finished the match with eight saves, making two vital saves during the second half of overtime. The redshirt sophomore has 45 saves so far this season, which is tied for the most saves amongst Big East goalkeepers alongside with Villanova’s goalkeeper Carson Williams. 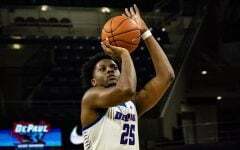 The Blue Demons will face their inner-city rival Northwestern on the road Tuesday night at 7 p.m CT. The Wildcats are also coming off a tie, breaking their three-game losing streak as well.